If you are unsure of your ring size you can purchase ring gauges online, alternatively most high street jewelers will provide this service free of charge. 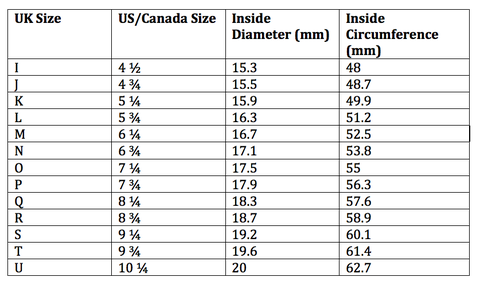 To gauge the ring size needed you may wish to measure either the diameter of a ring you currently own or the circumference of your finger with a piece of paper or string, and refer to the chart below. Ensure you consider the largest part of your chosen finger when taking measurements. Each piece is handmade to order in Glasgow, and will retain slight marks and irregularities that occur in the making process. This is a conscious aesthetic choice resulting in each item being individual, and differing slightly from the one pictured. If you are unhappy with your item, we are happy to exchange it within 10 days of postage. Items must not show signs of use and should be returned in original, undamaged packaging and must be returned with proof of purchase. please contact us at: info@powell-powell.com to arrange further details. Refunds will only be offered in the highly unlikely event of a faulty or damaged item. Postage and return postage costs will not be refunded unless the item is faulty. It is your responsibility to ensure any returns/exchanges are sent by appropriate means, it is recommended that you use a ‘guaranteed’ service. Earrings cannot be exchanged or returned, unless faulty, due to hygiene reasons. If you have any questions regarding exchange or refund policy, please do not hesitate to contact us.